The Fire Police Division at Eureka provides on-scene support at fire and EMS events keeping the public as well as our providers safe. 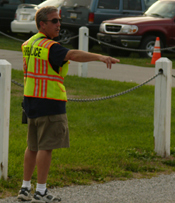 In addition they provide support throughout the community with traffic control. Fire Police at Eureka have all completed state certified training that teaches them how to provide effective traffic control, maintain scene safety and integrity, and handle crowds safely. Most fire police carry their gear and equipment in their own vehicles and respond directly to the scene when needed. Fire police are provided with turn out gear, radios and other required equipment.